Does Hillary Clinton Support Benjamin Netanyahu? Recently, a couple of articles have come out assessing Hillary Clinton’s position on Israel and the Prime Minister there, Benjamin Netanyahu. 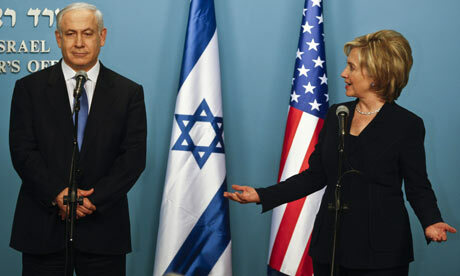 Hillary Clinton also made comments about the Boycott, Divestment, and Sanctions (BDS) movement that seemed inaccurate. BDS is a global movement to boycott, divest, and sanction companies that are involved with the occupation of Palestinian lands. For example, some governments or churches refuse to invest in Ford, Caterpillar, or Hewlett Packard, because those companies provide security systems and equipment to Israel Defense Forces (IDF) Border Patrol Units. A BDS movement was reportedly also used against Apartheid South Africa in the 1980’s and 1990’s. On July 2nd, Clinton sent a letter to Israeli American businessman / campaign donor Haim Saban, writing that “I know you agree that we need to make countering BDS a priority” in order to “fight back against further attempts to isolate and delegitimize Israel.” She sent a similar letter to Jewish communal leader Malcolm Hoenlein, according to The Times of Israel. In the letters, former Secretary Clinton also mentioned Palestinian efforts to “unilaterally declare statehood” at the U.N. — efforts that she is proud to have blocked, according to Bustle. However, more than 130 countries officially recognize Palestine as a state, writes Bustle, including The Vatican. Do Some Right-Wingers Want To Bomb Iran? Iran is fighting against ISIS in the Middle East, and backing Shia militias to help in the fight against ISIS. Does this make Iran our ally? That doesn’t matter to Louie Gohmert, who on Fox News said again that he would like to bomb Iran. Are Sunni And Shia The Same? Are all Muslims the same? Does religion play a role in the Middle East? Is ISIS and Iran on the same side, or are they fighting each other? Is Bashar Assad on the same side as ISIS? The turmoil in Yemen grew into a regional conflict Thursday, with Sunni Saudi Arabia and its allies bombing Shiite rebels allied with Iran, while Egyptian officials said a ground assault will follow the airstrikes. A new article by the Wall Street Journal states that Israel spied on Iran’s nuclear talks with the United States — and used the information to undermine the Obama administration’s position with the GOP-led Congress. The White House found out about the operation, the Journal reports, when U.S. intelligence agencies intercepted messages among Israeli officials containing details that U.S. officials believed could have come only from the top-secret negotiations. The WSJ claims it spoke with “senior White House officials” about the incident. “It is one thing for the U.S. and Israel to spy on each other. It is another thing for Israel to steal U.S. secrets and play them back to U.S. legislators to undermine U.S. diplomacy,” a senior U.S. official told the WSJ. U.S. officials say that classified information – such as the number of centrifuges that Iran might be able to keep operating as part of a final accord – were then shared with lawmakers in a concerted effort to derail the talks. Israeli officials deny that and told the Journal that they did not spy directly on American negotiators. “They say they got their information through other means, such as surveillance of Iran’s leaders or via one of the U.S.’s negotiating partners, such as the French,” states Politico. The report shows the growing rift between the Obama administration and the government of Israeli Prime Minister Benjamin Netanyahu, which has deepened in the wake of Netanyahu’s reelection last week. Israeli Prime Minister Benjamin Netanyahu sat down with MSNBC’s Andrea Mitchell for an interview – the first since he won re-election. They discussed several topics, including his recent election, his relationship with the White House, his speech in Congress, and his support – or lack of support – for a Palestinian state. What Does Boehner’s Visit To Netanyahu Mean? U.S. House Speaker John Boehner, who invited Israeli Prime Minister Benjamin Netanyahu to speak to Congress this month, will visit Israel in the coming weeks, his spokesman said Friday. Senior Israeli officials who asked to remain anonymous said Boehner will begin his visit – which has not yet been announced publicly – on March 31st, states Haaretz. He will be heading a delegation of Republican Congress members.